Learning how to compete… Do you know how to compete? I kept thinking about it and after going through it in my mind I reached certain conclusions that from my point of view explain my reaction regarding this matter on weather to compete or not. It seems to me that in order to compete it is necessary to learn how to do it, competition has to be taught since childhood, … I consider children should learn how to compete in fair and equal way at an early age, in order to gain competition and fair play, as strength tools for life. 1.- As I have said before, competing is a skill that can be learned… as many other skills we learn during our life, it is also important to learn how to compete… loosing the fear to compete, because competing makes us strong and confident. 2.- The secret to compete is to consider yourself as your best rival… once, someone asked if I liked to participate in swimming meets, I immediately answered yes, and that the main rival to defeat was my previous time, which means I wanted to defeat myself. This seems simple, but becoming your own rival requires you to overcome many obstacles and put into a test your own discipline, constant work, effort and hard work that you have gain through time… therefore, every time we go after a higher standard, which we have to set ourselves. The secret is never to lower such standard and never let yourself down. 3.- In addition to the above, from my point of view, I believe once we learn how to compete, and that we set ourselves as our main rival, we also have to compete to measure our skills against the best ones! With all due respect and admiration to those who have inspired us, but the general ideal is to become more like that person, try to reach their goals and achieve them, not to brag but to continue establishing new goals to keep on working. While thinking about all of these I read about the opinion of the greatest swimmer ever, who I admire for his work, discipline, constancy, hard work, perseverance, among other things, Michael Phelps, who wrote in his book “Beneath the Surface: My Story”, when someone asked him if he should compete against a great swimmer he respected and admired a lot (Ian Thorpe): ” I might not succeed, but I wouldn´t want to spend my career training every day without measuring myself against the best. The point of competition isn´t always to take the easiest way out, but to meet the biggest challenge”. I love the idea of growing and getting stronger this way! Which is the first step to compete? Encourage yourself to do it! Without fear, with enthusiasm and really enjoying it! If you compete, leave the numeric result at the finish line and assume the final result shall always be experience and knowledge. 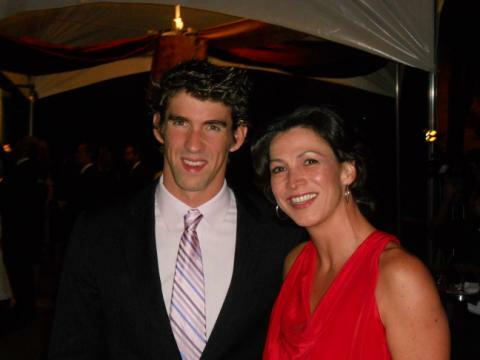 With Michael Phelps, when he visited Mexico City, 2010.